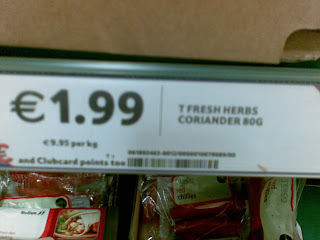 I was in Tesco Maynooth today and I picked up a small bag of coriander. I then saw that there was a larger bag available was better value. 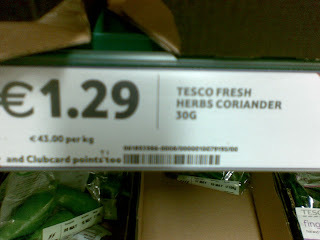 Looking closely at the shelf labels, I realised that someone at Tesco clearly can't do maths. 80g bag costing E1.99 (so better value) but the shelf label records the price per kg as E9.99, when a quick calculation tells you that the real price per kg is E24.88/kg. So although Tesco aren't making you pay more per kg for the bigger bag, it's clear that their pricing isn't accurate.